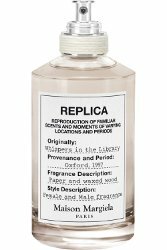 Maison Margiela has launched Whispers in the Library (Oxford, 1997), a new fragrance in the Replica series. Whispers in the library evokes the memory of a mysterious library made of antique woodwork perfectly waxed. The slowing down of time between books and the whispers of turning pages. Inspired by the scent of wax wood and paper, the combination of pepper notes with woody and warm notes of cedar and vanilla recreates the atmosphere of an ancestral library. This oriental woody Eau de Toilette is part of the REPLICA Collection. Maison Margiela Whispers in the Library is available in 100 ml Eau de Toilette. The library of my childhood was an old limestone building with creaky wooden floors built in 1913. Something that would recreate its woody, booky, antiquey scent would probably trigger some lovely memories. Yes! And do try CB I Hate Perfume In The Library too, if you haven’t already. This imagery appeals to me so much that I’ll be seeking out a sample. My favorite job in college was in a rare-books library. Best job ever. I would take that job right now! I was in high school back then.